The high-yield bond spread over US treasury securities is narrowing in anticipation of a steep decline in the default rate for below-investment-grade companies. Once the corporate sector is capable of sustaining economic growth, the high-yield bond spread should begin to approach its 473-point average of the previous two economic recoveries, says John Lonski, chief economist at Moody’s Investors Service. Moody’s forecasts that the US trailing 12-month high-yield default rate will decline from November 2009’s peak of 14.5% and February 2010’s 12.7% to 3.3% by the end of this year. “Monetary stimulus, the biggest fiscal stimulus jolt since World War II, and extraordinary efforts to assure an adequate supply of financial capital have improved the outlook for debt repayment,” Lonski says. “Occasional broadenings of the high-yield spread are possible until the US economy shows that it can grow without extraordinary assistance from Washington,” he adds. Long-term investment-grade corporate bonds were yielding 119 basis points more than comparable treasuries recently, while the high-yield bond spread was a more generous 597 basis points. 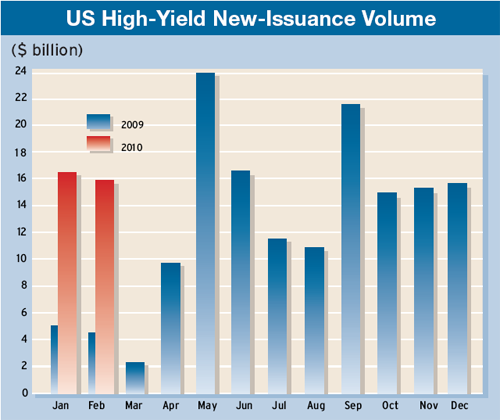 Investors seeking higher yields have been scooping up heavy issuance in the high-yield market this year. Some $15.8 billion of high-yield bonds, including public offerings and private placements, came to market in February, according to Montpelier, Vermont-based KDP Investment Advisors. That was only slightly below the $16.5 billion total for January, despite nervousness related to the sovereign debt crisis in Europe. It was also more than three times the amount of new offerings in the same period a year earlier. As the global economy continues to improve, companies are rushing to borrow before interest rates rise. Refinancings of both bonds and leveraged loans will be among the primary drivers of bond issuance in 2010, according to Lonski. “Expectations of significantly higher borrowing costs by late 2010 or early 2011 may give rise to a wave of ‘prefundings,’” he says. By the second half of this year a growing number of bond issues will fund acquisitions, he adds. Both leveraged loan issuance and the use of commercial paper, or short-term IOUs, are likely to recover significantly during 2010’s second half, Lonski says. 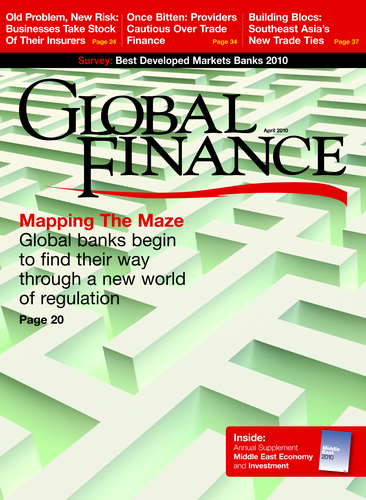 “However, recent proposed changes in bank regulation add to uncertainty,” he says. After falling by 19% in 2008, dollar-denominated investment-grade corporate bond issuance rose by 32% in 2009 to a record high. The issuance of high-yield bonds plunged 57% in 2008 but more than recovered last year, with a surge of 151%, according to Moody’s. The ratings agency expects investment-grade issuance to equal last year’s record, and high-yield bond offerings to increase by about 10%. As the US economy improves, the growth of business sales should prompt the return of material jobs growth by the middle of this year, Lonski says. “The vulnerabilities of a weakened financial system may compel the Federal Reserve to adhere to an exceptionally accommodative monetary policy,” he says.